Although the UK economy was one of the strongest in the developed world in 2014, the UK stock market returned just 1.2 per cent. The globally-diversified developed world index returned 12.1 per cent. News headlines can paint an inaccurate picture of the effect of world events on stock market returns because they do not provide perspective. Russia and Greece hit the headlines in 2014 and, for different reasons, caused some concerns for investors. Both markets fell in 2014, Russia by 42.5 per cent and Greece by 36.2 per cent. But neither fall would have made a significant contribution to the overall performance of a globally diversified portfolio, because both markets are relatively small. To give this some perspective, Apple, the world’s most valuable listed company, is worth more than three times Russia and Greece combined. 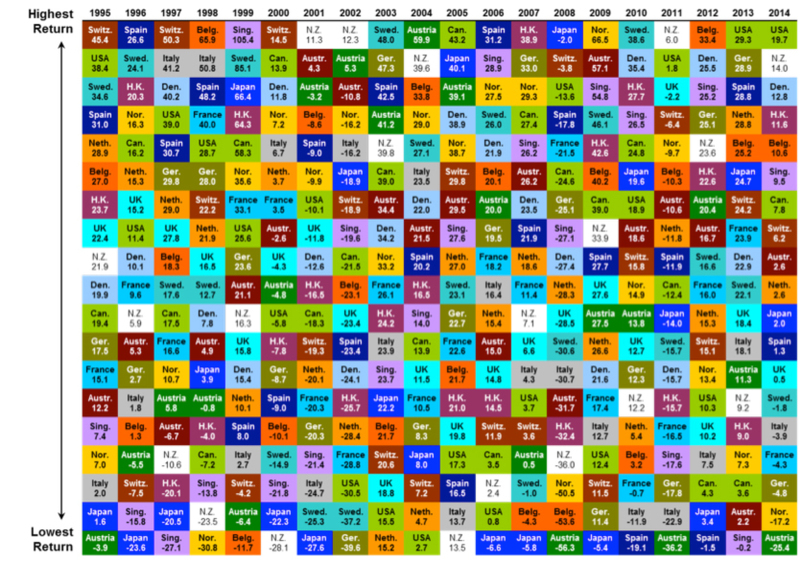 “The Randomness of Returns” is colourfully illustrated in the image above – the table ranks historical annual stock market performance in GBP for different developed and emerging markets from highest to lowest in each year. Each colour corresponds to a different country and the patchwork dispersion of colours shows no predictable pattern in either the developed or emerging markets. It also demonstrates that a well structured investment plan, and a diverse portfolio, is critical in ensuring long-term financial security. If you would like to speak to one of our specialist financial advisors about your own investment plans, please call Tim Norris or Alan Clifton on 0800 731 7614 or e-mail enquiries@fpgonline.co.uk and we’d be delighted to help.